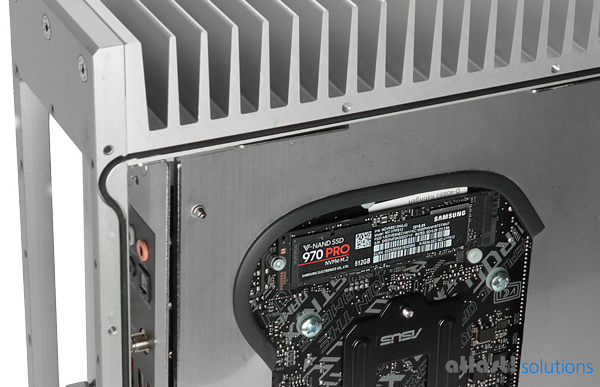 This 8th Generation Fanless PC has moved fanless performance into new territory. The 6-core i7 CPU has performance levels 40% higher than our previous 7th Generation i7 product. We include high performance DDR4 3000Mhz memory and the latest Samsung 970 PCIe SSDs which have exceptional performance, creating a system that is suited for intense industrial or business use. The industrial grade case has an extremely robust design. The embedded O-ring gaskets and silicone seals protect the inbuilt system from water spray and dust. This model features the ASRock Z390 Phantom motherboard, which uses premium components throughout. With Thunderbolt 3 and HDMI 2.0 its uses are almost unlimited. Using a Thunderbolt to HDMI adaptor you can have a multi-monitor setup with 3 displays. The new Z390 Chipset enables 4 of the 6 USB3.1 Ports to be "Gen 2" with 10Gbps speed. The product uses a copper block on the CPU that connects to the external cooling fins using heat pipes. The motherboard's chipset is also cooled with a heatpipe. This design enables the product to not need air vents and enables it to be used in dusty/dirty environments. Because there are no moving parts and no air sucked into the case the product has zero maintenance and high reliability. The internal industrial fanless power supply enables intense 24/7 operation. No external power adaptor is needed, the PC only requires a mains power lead. Worldwide voltages are supported. An additional 4 x 2.5" SSD or Hard Drives can be added which can be configured as RAID 0/1 pairs for speed or security. User Access to fast PCIe SSD: The chassis has been adapted so that it is possible to access the ultra fast PCIe SSD that is on the underside of the motherboard. Simply remove a few screws in the PC's base plate, and once the base plate is removed the SSD can be replaced. The SSD has a thermal pad so that even under extreme loads it does not overheat. This photo shows the base plate and thermal pad removed. We can create a solution to meet your specific requirements. Other motherboards and CPUs can be installed to make a fanless system matching your requirements. Please get in touch with the contact form, online chat, or give us a call. The NVMe M.2 SSD uses the PCIe interface to bypass the limitations of the traditional SATA interface. If the 32GB option is chosen the equivalent 2x16GB modules are used.